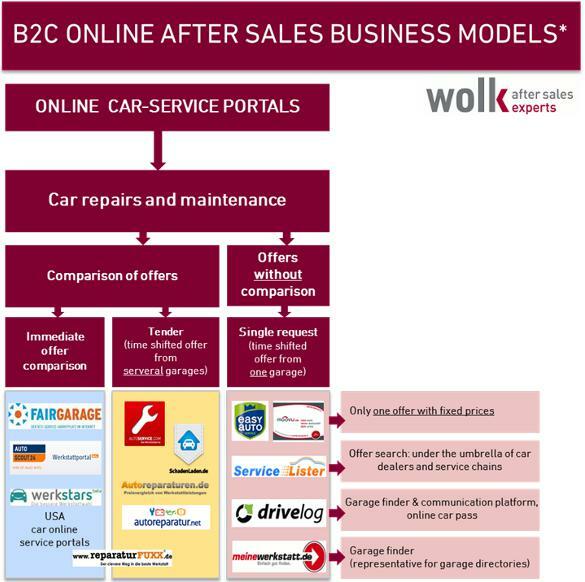 What will be the impact of “car service online portals” on car drivers future behavior regarding car maintenance and repair? The car service market is one of the last markets which has been asserted by the internet. Car service online portals will undoubtedly make the service-market more transparent! Transparency refers not only to the price: Above all it includes the quality of service, the parts quality, the type of a service garage, the availability of appointments and the regional availability. The usual concerns and upcoming changes of current structures are contrasted by new opportunities and challenges. 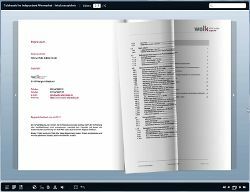 The drivers opinions on this subject and the changes in their market behaviour set the frame for wolk after sales experts' study "After Sales Goes Online". Therefore, in August 2012 a total of 1.062 German car drivers were asked to fill in an online questionnaire. 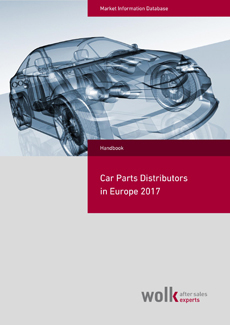 CONTENT: The study describes the far-reaching implications of the various target groups and car service typologies in great detail and provides concrete help to actively encounter this process of change. PAYMENT: After receiving your order we will send you an invoice. Please deliver us yout VAT number. When the payment is done you will get your access data by mail and/or the printed version will be send to you. PRICE: 2.450,- Euro for online version. 75,- Euro extra for printed version. 4.3. Who performs the car service? 8.3.7. What are the challenges that Auto-Service comparison portals will have to face? The results of the study show that online-savvy car drivers spend almost two days per week on the Internet. Here, the online buyer spend an annual average of € 830 (including VAT) for online products and services. In the future the online expenses of online-savvy car drivers will grow by 11%. Already 35% of car drivers informed themselves online on offers and qualifications of auto repair shops. Despite the complexity, 60-70% of all drivers can imagine to book car service and maintenance in the future via the Internet. These data point to a growing share of the online available car service opportunities within the whole car service market which has to face major upheaval in the next 10 years. 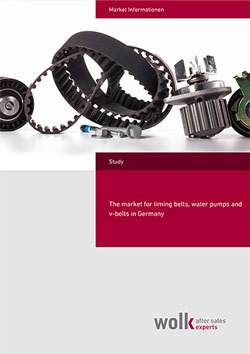 The survey was held in August 2012 and is based on an online questionnaire with 1.062 participants in Germany. 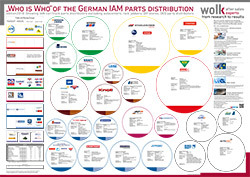 The sample was chosen randomly according to representative criteria of the main unit of German car drivers. The representative criteria were the structure of age by years, gender, residence, car brand segment and car age by years. With the help of an online panel it was possible to allow only German car drivers to participate at our online questionnaire. Those participants were responsible for car service and maintenance for their own cars in the household. If they were not the responsible person for car maintenance and service they were pleased to complete the questionnaire together with the decision maker. 83% of the questionnaires were completed by persons who are responsible for car service and maintenance. The questionnaire had 38 questions and was divided into five blocks. In addition to wolk after sales experts' study, special online trainings in cooperation with established experts are offered. This way, renowned aftermarket online actors have already been advised and supported to realize their online activities. 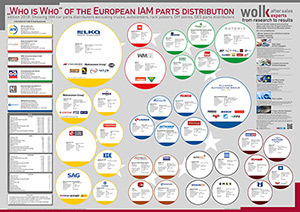 Consultats of wolk after sales experts have a concentrated practical knowledge about the European car aftermarket which is supported by an extensive European aftermarket database. Which online business models are available? What potential opens up the Web? How do you integrate the customer routing for your garage partners? How do you connect your online activities with your existing sales concepts? How do you avoid online cannibalisation? What are the costs and rates of return are you expecting? 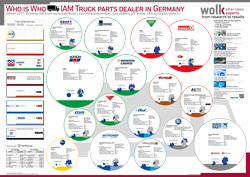 If necessary, we will support you in all questions of implementation with a powerful aftersales network of experts. Online education software, logistics, legal and marketing specialists will help you quickly and easily to achieve good results.